On the Nature of Prejudice commemorates the fiftieth anniversary of the publication of Gordon Allport’s classic work on prejudice and discrimination by examining the current state of knowledge in the field. A distinguished collection of international scholars considers Allport’s impact on the field, reviews recent developments, and identifies promising directions for future investigation. Organized around Allport's central themes, this book provides a state-of-the-art, comprehensive view of where the field has been, where it is now, and where it is going. John F. Dovidio is Professor of Psychology at the University of Connecticut. His publications include Reducing Intergroup Bias (with Samuel Gaertner, 2000) and The Social Psychology of Helping and Altruism (with David A. Schroeder, Louis A. Penner, and Jane A. Piliavin, 1995). Peter Glick is Professor of Psychology at Lawrence University. Along with co-author Susan T. Fiske of Princeton University, he received the 1995 Gordon W. Allport Prize for his research on ambivalent sexism. Laurie A. Rudman is Associate Professor of Psychology at Rutgers University. She is currently an Associate Editor for the journal Social Cognition and serves on the Editorial Board for the Journal of Personality and Social Psychology. Foreword by Victoria M. Esses. 1. 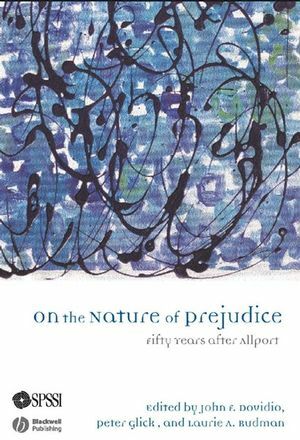 Introduction: Reflecting on The Nature of Prejudice: Fifty Years after Allport. (John F. Dovidio, Peter Glick and Laurie A. Rudman). 2. What is the Problem? Prejudice as an Attitude-in-Context. (Alice H. Eagly and Amanda B. Diekman). 3. Social Cognition and Prejudgment. (Susan T. Fiske). 4. Ingroup Affiliations and Prejudice. (Rupert Brown and Hanna Zagefka). 5. Categorization, Recategorization, and Intergroup Bias. (Samuel L. Gaertner and John F. Dovidio). 6. Paternalism and the "Rejection" of Outgroups. (Mary R. Jackman). 7. Rejection of Women? Beyond Prejudice as Antipathy. (Laurie A. Rudman). 8. Group Differences and Stereotype Accuracy. (Charles M. Judd and Bernadette Park). 9. The Psychological Impact of Prejudice. (Brenda Major and S. Brooke Vick). 10. Mechanisms for Coping with Victimization: Self-Protection Plus Self-Enhancement. (James M. Jones). Part III: Perceiving and Thinking About Group Differences. 11. Cognitive Process: Reality Constraints and Integrity Concerns in Social Perception. (Vincent Yzerbyt and Olivier Cornielle). 12. Linguistic Factors: Antilocutions, Ethnonyms, Ethnophaulisms, and Other Varieties of Hate Speech. (Brian Mullen and Tirza Leader). 13. Stereotypes in Our Culture. John T. Jost (New York University) and David L. Hamilton (University of California, Santa Barbara). 14. Instrumental Relations Among Groups: Group Competition, Conflict, and Prejudice. (Victoria M. Esses, Lynne M. Jackson, John F. Dovidio, and Gordon Hodson). 15. Choice of Scapegoats. (Peter Glick). 16. Allport's Intergroup Contact Hypothesis: Its History and Influence. (Thomas F. Pettigrew and Linda R. Tropp). 17. Intergroup Contact: When Does it Work, and Why? (Jared B. Kenworthy, Rhiannon N. Turner, Miles Hewstone, Alberto Voci). 18. Conformity and Prejudice. (Christian S. Crandall and Charles Stangor). 19. The Development of Prejudice in Childhood and Adolescence. (Frances E. Aboud). 20. Breaking the Prejudice Habit: Allport's "Inner Conflict" Revisited. (Patricia G. Devine). 21. Inner Conflict in the Political Psychology of Racism. (David O. Sears). Part VI. The Dynamics of Prejudice. 22. Aggression, Hatred, and Other Emotions. (Eliot R. Smith and Diane M. Mackie). 23. Allport's "Living Inkblots": The Role of Defensive Projection in Stereotyping and Prejudice. (Leonard S. Newman and Tracy L. Caldwell). 24. Personality and Prejudice. (John Duckitt). 25. Religion and Prejudice. (C. Daniel Batson and E. L. Stocks). Part VIII. Reducing Group Tensions. 26. Intergroup Relations Program Evaluation. (Walter G. Stephan and Cookie White Stephan).